Meek Mill's battle for his freedom may be over for now, but in his fight for criminal justice reform, the war has just begun. When the Philadelphia rapper, whose full name is Robert Rihmeek Williams, was sentenced to two to four years in prison last November after a pair of arrests that violated his probation from a 2008 gun and drug case, his case sparked outrage among criminal justice reform advocates and reinvigorated a national debate on mass incarceration. The Pennsylvania Supreme Court ordered Mill's immediate release on "unsecured bail" in April, citing "credibility issues with a police officer who was a 'critical witness'" in Mill's case. But his request for a new trial was denied in June. 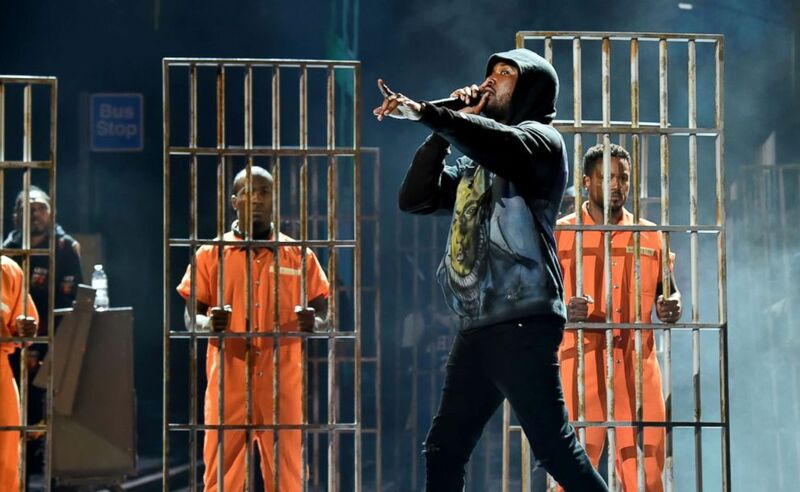 In the wake of a relentless #FreeMeekMill campaign, on his "first day out," the rapper pledged to spotlight the stories of others who he says are the victims of a flawed criminal justice system. Asked about the challenges he is facing in raising awareness about prison reform, Mill said that people have become desensitized to mass incarceration. Meek Mill performs onstage at the 2018 BET Awards at Microsoft Theater on June 24, 2018 in Los Angeles. "The challenge is really society acting as if it's normal. It's not a normal thing. This is really happening to people's lives," he said, adding, "It's a long process you just got to be dedicated to it ... and I'm dedicated to help making change." In an interview with ABC News, Mill reflected on his evolution as an activist, the importance of voting in the midterms, whether he would work with the Trump administration and shared the story of Eric Riddick -- a man he met in prison, who has been fighting for his freedom for decades. Since 1991 Riddick has been serving a life sentence for first-degree murder and upon learning that the lone witness in the case recanted his testimony, he filed an appeal that was rejected because the judge said it was too late. In a letter accompanying the latest denial for Riddick's appeal, a judge on the case wrote that it is "likely that an innocent man sits behind bars for no better reason than a poorly conceived statute." Mill said that Riddick's case, which is being reviewed by Philadelphia's Conviction Integrity Unit, is an example of a broken system, where "judges can actually believe you're innocent but still keep you in prison," and he urged people to vote in the 2018 midterm elections, particularly for local officials like district attorneys and judges. "We're the people who have to be judged by these people," he said. "I think we should all use our power and (vote for) people who are normal people and people who will use power with morals." Ahead of a meeting with state leaders on prison reform Thursday, President Donald Trump privately expressed openness to supporting broader sentencing reforms beyond the narrower reforms to the nation's prison system that he's previously backed, sources told ABC News. 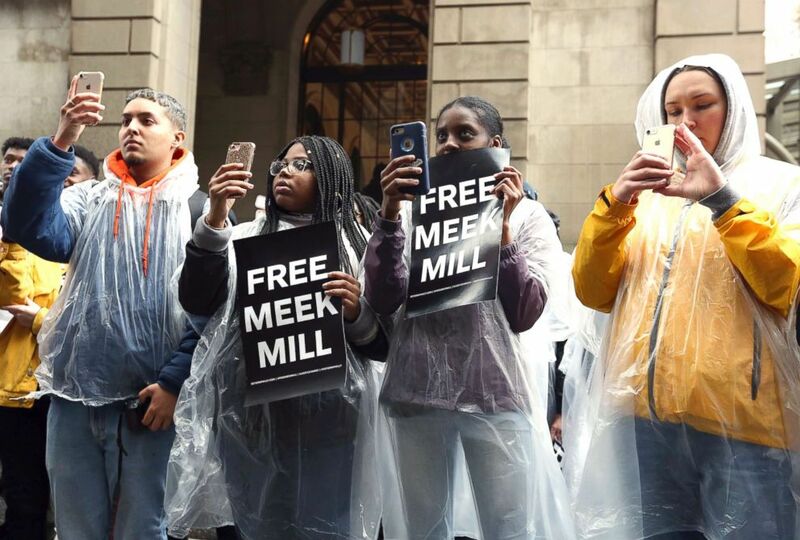 Protesters uses their phones and listen to a speaker in front of a courthouse during a hearing for rapper Meek Mill, April 16, 2018 in Philadelphia. In May, TMZ first reported that the rapper was scheduled to visit the White House to participate in a panel about criminal justice reform, but he told Billboard at the time that he canceled the visit because "Unfortunately, the focus turned to the president and myself which concerned me that it might take away from creating a positive result from today's discussions." Asked if he would consider appealing to Trump to bring attention to Riddick's case, Mill said that this is a state case, not a federal one, but added that "the only way I would be involved with the White House is if the White House is helping non-violent drug offenders or people who have got large amounts of time for crimes that don't match the time." Mill, whose music has always touched on social issues, said that his fight for criminal justice reform has inspired his latest releases, including songs like "Stay Woke" and "Milidelphia" from his latest EP, "Legends of the Summer." 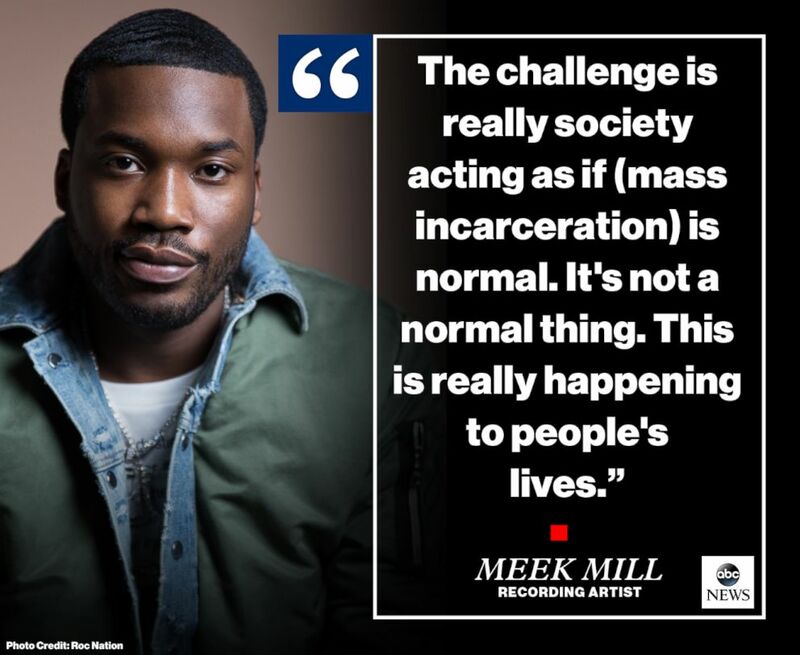 "It's still edgy Meek Mill, energy, social forecasting where I come from, the bottom of Philadelphia, the trenches, but it's still mixed with how I'm speaking on politics of the justice system and the odds against young black and Hispanic Americans," he said.